Sunday is always football and catching-up-on-laundry day around here, and even though our favorite team (Go Niners!) 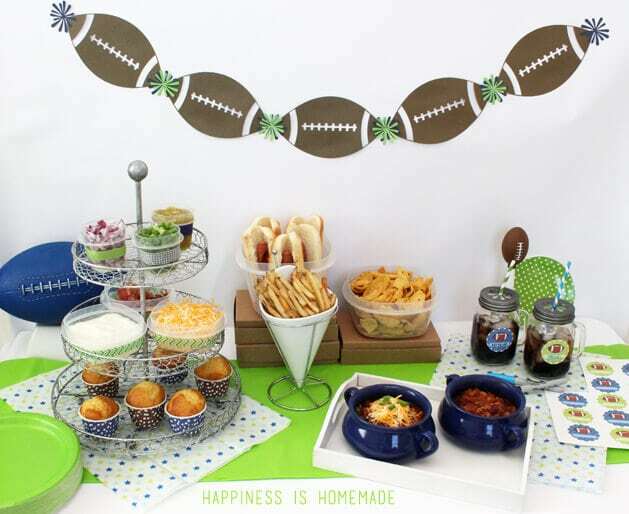 didn’t make it to the Super Bowl this year, you can bet we’ll be watching the big game and munching on our favorite game day foods. 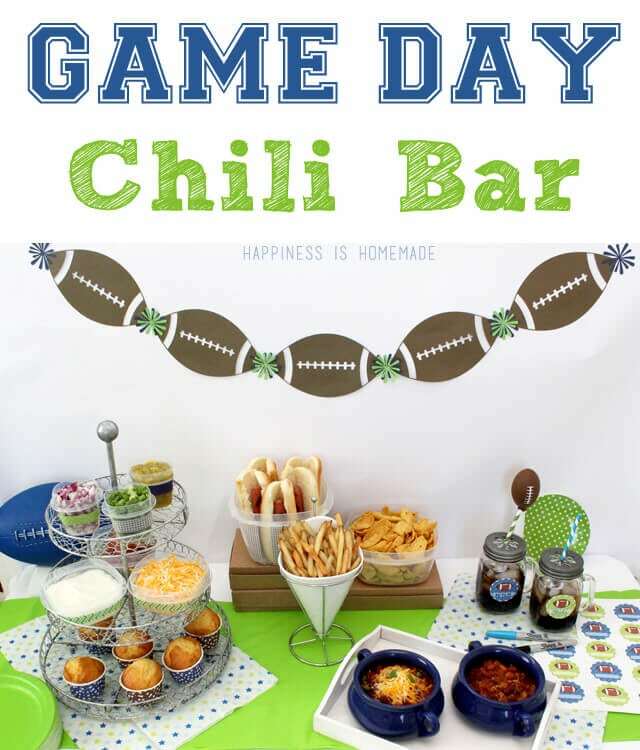 There’s just something about football games and chili that seem to go hand-in-hand, so I decided to set up a chili bar for our Super Bowl football party. 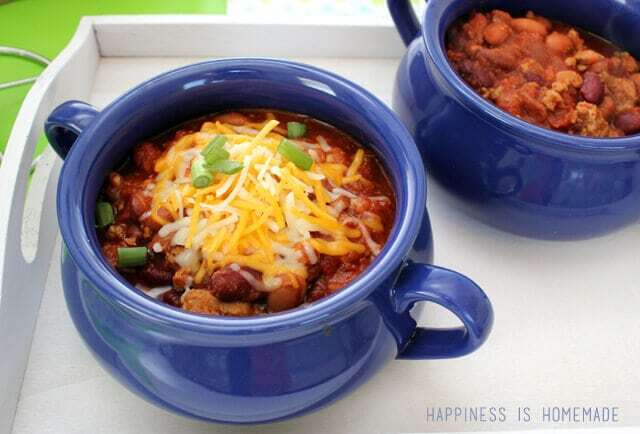 My chili recipe is really easy to make, and it tastes even better after the flavors have had some time to mingle together for awhile, so I usually make it the day before my party. Brown the ground turkey, onions and garlic in a skillet. Drain if necessary and add to a large stock pot along with all of the other ingredients. Simmer on low heat for at least 4-6 hours; adjust spices as necessary. 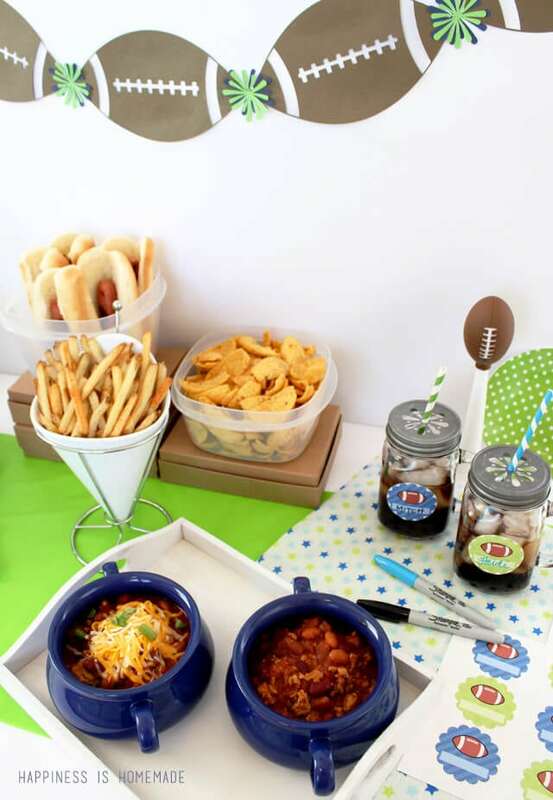 On game day it’s simple to reheat the chili and set out a spread full of your favorite chili fixin’s and friends – red and green onions, bacon, cheese, sour cream, green peppers, corn chips, turkey hot dogs, cornbread and garlic fries! I like to prepare my toppings the day before the party as well – just chop up everything, pop ’em into Rubbermaid containers, and store in the fridge until serving time. I added patterned washi tape in team colors to dress up my containers for a little extra fun. I love how easy it is to get everything set up on game day when you’ve done most of the prep work the day before, and the Rubbermaid containers also make cleaning up the leftovers a breeze, too! 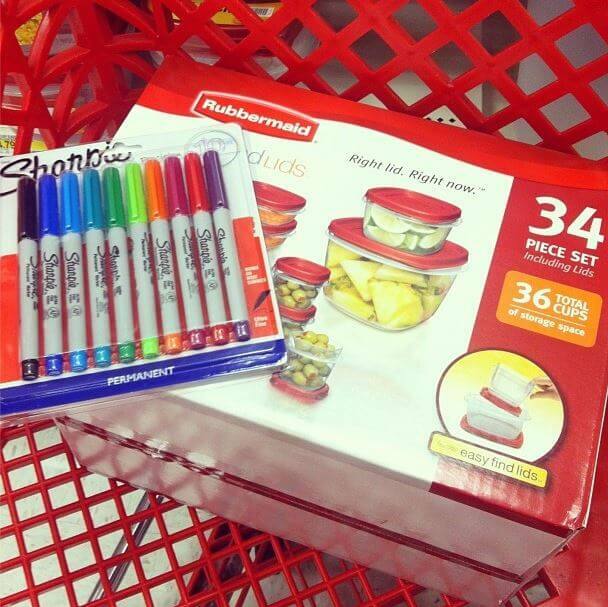 I picked up this set of Rubbermaid containers along with some Sharpies when I was shopping at Target the other day because they’re both included in the newest set of mobile coupons, and I knew they’d be perfect for our Super Bowl party. Did you know that you can text “COUPONS” to TARGET (the name goes in the phone number field) to get coupons sent right to your phone? I just discovered it recently, and it’s awesome – just scan one single bar code on your smartphone at the register and all of the discounts available will be applied to your cart. The Rubbermaid and Sharpies deals are for $1 off (through February 8th), so I took advantage of the fact that they were both also on sale to stock up. 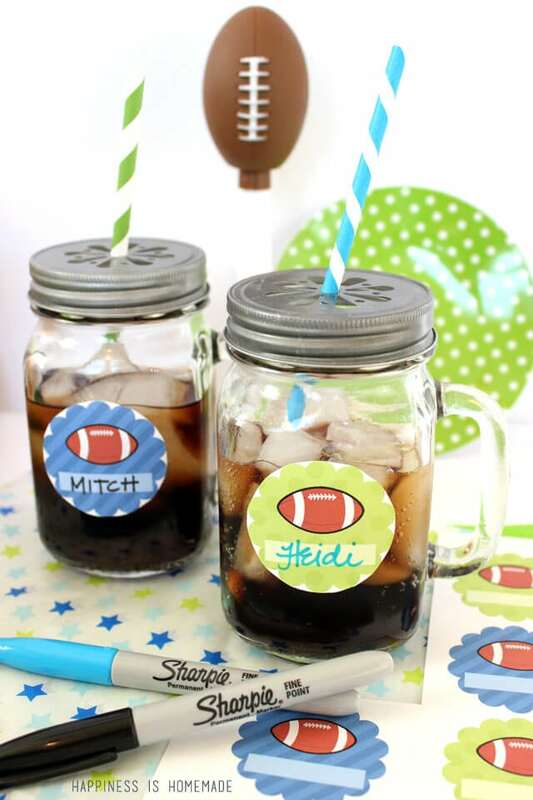 To avoid mixing up our drinks at the party, I made some cute football beverage labels. I printed the design out on to an 8.5″ x 11″ label sheet and used a circle punch to cut them out. 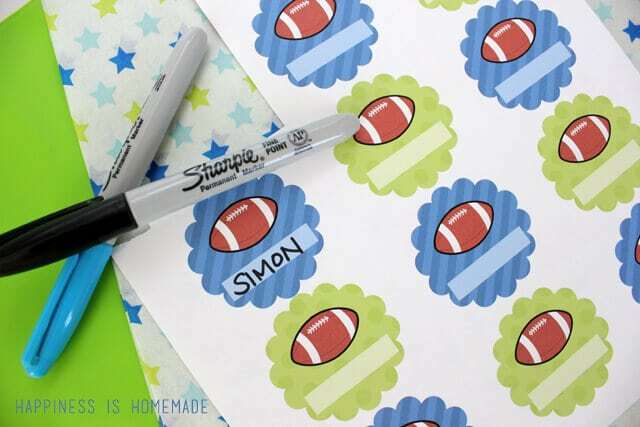 I used the Sharpie markers to write our names on the labels to ensure that the ink was permanent and wouldn’t bleed. I also really wanted to use an actual football as part of my table decor, but the only one that my boys would part with was an old faded and icky one. No worries though! 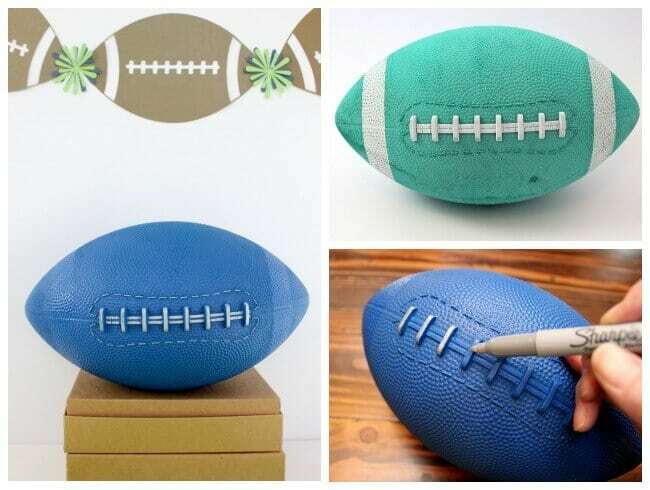 A quick coat of paint and some detailing with a silver Sharpie, and I soon had a football decoration that coordinated with my team colors! 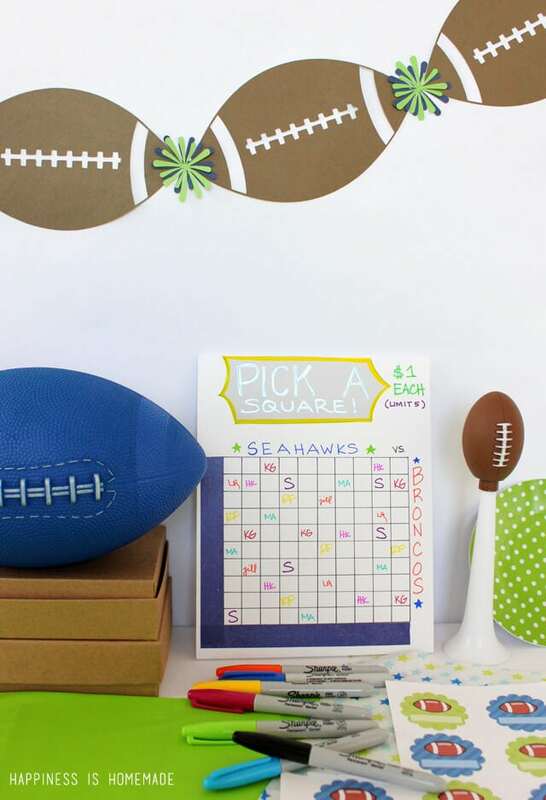 My favorite things about Super Bowl parties are the side bets and wagers that we always have going on, and my favorite game of all is called Pick a Square! To claim a square, each person pays $1 per square into the kitty, and adds their initials to the box. Squares can be purchased throughout the first half of the game. Under those strips of dark blue washi tape are numbers 0-9 (in random order) that coordinate to the last digit of the score. We keep the numbers covered until the end of the first half of the game and then uncover them to see who claimed the square that matches the current score. For example, if the halftime score is Seahawks 7 – Broncos 0, the person with the square at the coordinates of S7 B0 would win! We usually have one winner at halftime for half of the kitty and a winner at the end of the game for the other half, but you can split it up by quarter or even opt to have just one winner based on the final score. 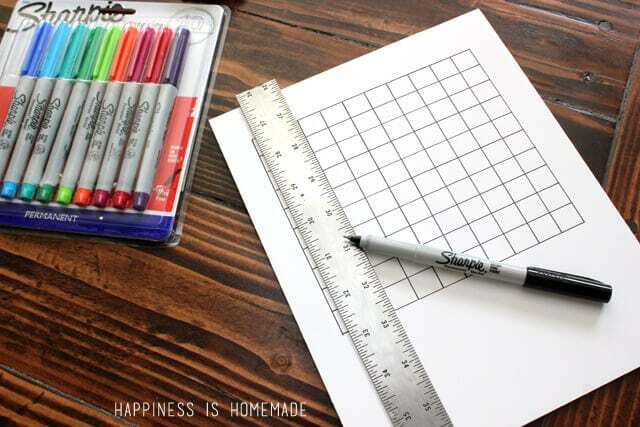 Just make sure to hide the numbers under washi tape so that it won’t permanently stick to your game board! Hearty chili with loads of toppings, football banter, and luck-based wagers…I can’t wait for Super Bowl Sunday! This is such a great idea! I love chili and I love to top it with goodies! Your decorations are fab! I especially love the football banner!! Awesome job! Love this post! 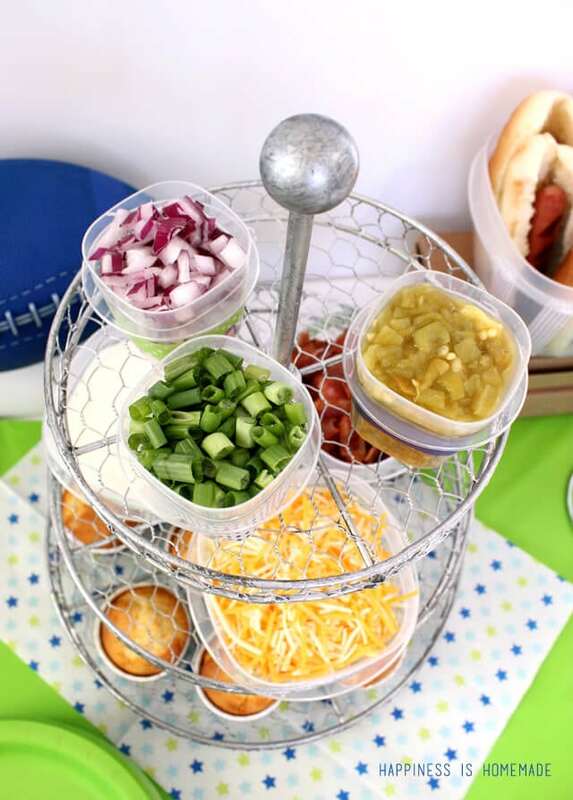 Great game day ideas! So bummed the Niners didn’t make it too! 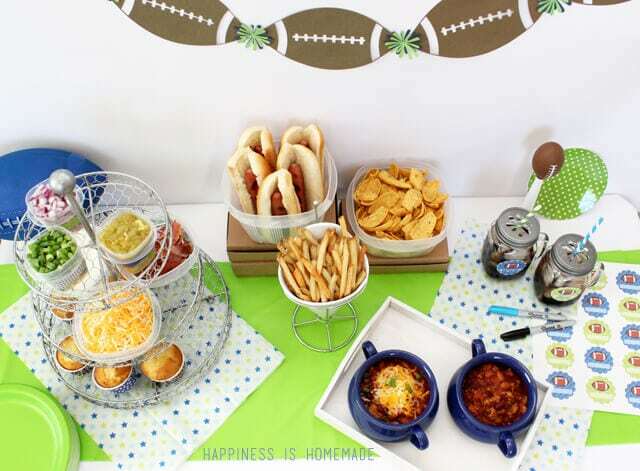 But, love your party decor and a chili bar is perfect for game day. I love Pick a Square and love that you colored the laces with Sharpie, so awesome.